Spend $60.00 on a good quality router plate. Spend another $30.00 on a T Track / knob kit (watch for sales on both of these, they go a LOT lower!). Spend the rest on good quality plywood or MDF (your choice) and tempered hardboard. got this one it’s a sears craftsman router table, for 119 bucks. it’s really nice and laid out really well, and has storage in both sides for bits and such. I would add. Make friends with a kitchen counter installer. A large sink cutout from laminated kitchen counter surrounded by oak makes a great table. Or, closeout or demos of laminate counter top. I have one as my main router table, with a 3 hp router. Also, I have a table top from a fast food restaurant that was remodeling. I mounted it to an old gas grill base, for a semi-mobile router. It has a 2 hp router mounted in it for small jobs. The “big” table cost me about $200 to make. The “little” one costs $30 for the router plate and $3 for paint. Everything else was dumpster dive or salvaged. Maybe these will give you a few ideas to get your started. Peachtree Woodworking Supply sent out e-mail ads this morning, I have already deleted it but the link below shows the one that was advertised at 50% off. Regular price is $179.00 with the mounting plate. Build your own table…...that way you’ll get what you want , and gain experience, and learn from your mistakes as you go along….If you’re gonna woodwork, you might as well jump in and get wet…sooner or later it’s gonna happen…..start now…...!!!!!!! I built a workable table in about 1.5 hours. I followed the recommendations of Doug Stowe who is a professional woodworker who does boxes among other things. It consists of a 2×3 piece of 3/4 plywood with the router attached with simple screws. You rout out a recess for a piece of lexan which you cut to size. With a straight edge attached at a pivot and clamped at the other end you can get some very fine adjustment. The whole setup cost about $25….. I will probably build a more robust table some day but this works surprisingly well and can be clamped to a table saw or work bench…whatever is best for you. Best of all it stores away and takes almost no space. If you are interested send me an email and I”ll forward a copy of his plan. Lets just say I think I put the cart before the horse and bought the router, sander, table saw and jointer before I really knew how to use them so Im not 100% confident that I can make acurate enough cuts for an effective table. So far Ive just been playing around with outdoor furniture. Well, there is no better place to start building your confidence than to build your first router table. You have the tools to do it. When I taught woodworking the router table was always the first project. It can incorporate a lot of basic and advanced joinery to get practice with, but really is an easy build. 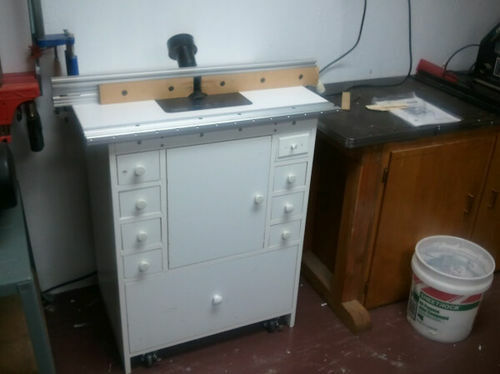 Besides you really need to learn how to build a router table, it’s rare to find someone that is 1000 percent satisfied with the one they have, so people are always building a new one. Even Norm Abrams has rebuilt his at least a half dozen times. So I’m with dbhost, build your own. And you’ll get a lot more bang for the buck. You can find them used too. I got this one off my local Craigslist for $75.00. I wanted to build one but this was cheaper than the material I would have needed to build one. you can catch the Rockler top on sale in that ball park from time to time. I agree with building one. You can get as elaborate or as simple as you like. Plus make it suit your needs and space perfectly. That’s why they call some work custom made and it’s highly prized! $140 + shipping. Best deal hands down. Complete, Top, plate, legs, fence, dust port. I think building a router table would be a good project for a beginner but not all of us have all the tools. It seems to me that a tablesaw would be absolutely essential in building the table. I am curious though, Tom148 seems to mention a simpler way to approach building a table. Are the plans posted somewhere? I’d surely like to see them. I just bought the table brtech mentioned. It’s pretty great for the price. The plate is plastic and I will upgrade it to the metal plate soon. Other than that, I couldn’t be much happier. Here’s a super-simple table and microadjuster. You can knock them both out in an afternoon with minimal tools and skill. I built mine with a circular saw, a drill press and a Forstner bit, along with some bits of hardware.